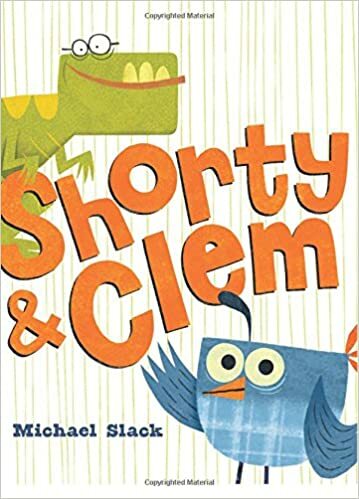 Summary: When Clem (a quail) steps out for a while, his friend Shorty (a short dinosaur called a shortysaurus) discovers a package addressed to Clem. Shorty vows not to open it, but can’t help guessing the contents, then treating the package as if it contained that item. He guesses a race car and tries to drive it, then a trampoline and tries to jump on it. Finally, he decides there are monkeys in the package, and that’s too much. He loves monkeys so much that he rips open the box, and discovers a pair of monkey slippers inside! Excitement turns to shame as he realizes he opened his friend’s package. 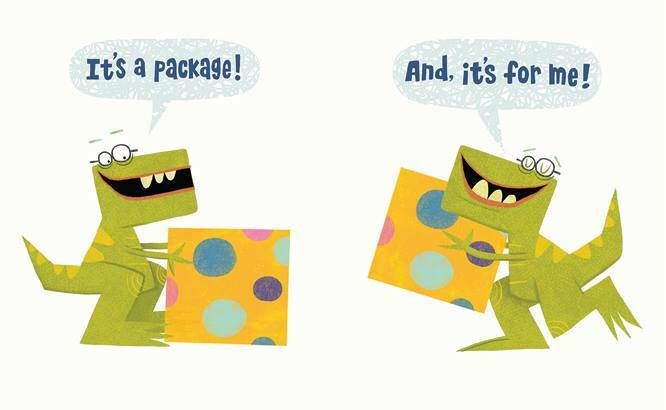 When Clem returns, he tells Shorty he ordered the slippers for Shorty, knowing his dinosaur friend would open the box. Shorty declares his love for the slippers, and even more, for Clem. 40 pages; ages 4-8. Pros: Lots of laughs, not to mention a celebration of friendship, for the preschool and primary set, with the whole story being told in dialogue. Cons: Yet another Elephant & Piggie-inspired friendship story told in cartoon bubble dialogue.